While the following Marine Corps MOS's (Jobs) do not require U.S. Citizenship, one must be a legal immigrant (with a green card) residing in the United States in order to join any branch of the United States Military. The green card is slang for Permanent Resident Card. It used to be green, but now looks more like a driver's license. The card is issued by the Citizenship and Immigration Services of the Department of Homeland Security and contains a photo and fingerprint. The Department of Defense, and in this case the Marine Corps, cannot and will not assist with immigration. One must legally immigrate first, and then apply to join the U.S. Marine Corps. 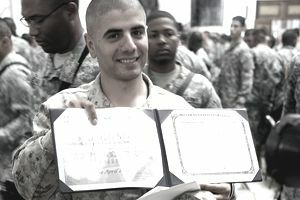 Once an immigrant joins the U.S. Military, normal residency requirements are waived and they can apply to become a United States Citizen, after 3 years of active duty. One must be a U.S. Citizen to become a commissioned officer, or to re-enlist in the military. The below MOS's are the jobs that non-citizens are allowed to do in the Marine Corps. These do not require a high security clearance. Only citizens are allowed to be given secret security clearances and above. Special provisions of the Immigration and Nationality Act (INA) state: U.S. Citizenship and Immigration Services (USCIS) may expedite the application and naturalization process for current members of the U.S. armed forces and recently discharged service members. Here is some of the history of helping to speed up the process of becoming a citizen of the United States for military members and veterans. Recently, President George H.W. Bush and his son President George W. Bush signed executive orders which allowed any military member (active duty, Reserves, or National Guard) to apply for citizenship, without any residency requirement. These orders also covered veterans of certain designated past wars and conflicts. This saves the military member five years on the civilian applicant for citizenship so when you hear the military help you accelerate the process, this is what that means. What Does It Take to Become a Marine Corps Electrician? What Does a Combat Correspondent Do in the Marines? What Does a Marine Corps Job (FMOS 0911) Drill Instructor Do? What Does a Marine Corps Job (MOS 3432) Finance Technician Do?